There are many flaws in transhumanist utopian ideas, most notably their refusal to acknowledge that transhumanism will result in a world where the enhanced super-humans will naturally rule over the stupid, weak and miserable unenhanced. Those that can afford or have access to enhancements will be the elite and those who do not or cannot be enhanced will be second class citizens. We are already justified in the con­viction that human life as we know it in history is a wretched makeshift, rooted in ignorance; and that it could be transcended by a state of existence based on the illumination of knowledge and comprehension, just as our modern control of physical nature based on science transcends the tentative fumblings of our ancestors, that were rooted in superstition and professional secrecy. The human species can, if it wishes, transcend itself —not just sporadically, an individual here in one way, an individual there in another way, but in its entirety, as humanity. We need a name for this new belief. Perhaps transhumanism will serve: man remaining man, but trans­cending himself, by realizing new possibilities of and for his human nature. The American Eugenics movement resulted in the forced sterilization of over 60,000 Americans in 33 states. And eugenics did not stop there. Adolf Hitler was a huge fan of eugenics and brought it to its natural conclusion: the Holocaust of World War II where millions of the “genetically unfit” were exterminated in an effort to create a master race. Those considered unfit were not just Jews, but the also the criminal, weak, feeble-minded, insane, and disabled. 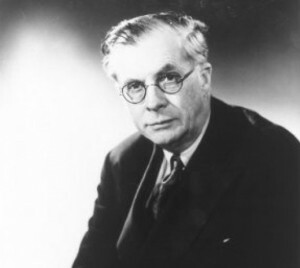 Huxley wasn’t just any eugenicist either. He was president of the British Eugenics Society from 1959-1962, more than a decade AFTER the horrors of the Holocaust were revealed. He coined the term transhumanism right before his tenure as president of the British Eugenics Society. I don’t believe modern transhumanists have any idea where their ideology originated, but it is still instructive toward what will lie ahead if they get their way. We have tried transhumanism already, only it was called eugenics then. Eugenics, in its attempt to control the direction of human evolution, did in fact create a world where the lesser humans were second-class citizens whose rights and lives were forfeit to the “greater good” determined by the elite. Loved this piece. I wonder if you’ve read the article in TIME Magazine on Robert Kurzweil et al., titled “2045: The Year Man Becomes Immortal“? There’s quite a bit of this dangerous mishegoss in the article, the backbone of which is Raymond Kurzweil’s formalizing technological progress into a mathematical equation. I’d be interested in reading your take on it.